In the fast-paced digital world our children live in, the practice of reading is often overshadowed by a media-rich environment dominated by television, YouTube, and video games. The ironic twist in this new reality is that our children will increasingly need to rely on their literacy skills to have access to careers that demand a post-secondary education. The distractions of our tech-infused world make it ever more enticing for our children to stay glued to a screen rather than delve into a good book, yet this world cannot be sustained without a healthy supply of literate, educated young adults. The statistics are alarming. 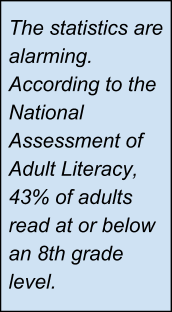 According to the National Assessment of Adult Literacy, 43% of adults read at or below an 8th grade level while 44 million adults, (23% of the population), are considered functionally illiterate. The same study found that 75% of state prison inmates can be classified as low literate, illustrating the vital importance literacy plays in our society. Perhaps most heartbreaking is the long term effect low-literacy has on children of these adults – children who never hear a bedtime story or receive help with homework because their parent can’t read. Low literacy becomes intergenerational. The strongest indicator of a child’s success in school is the mother’s level of education. In light of these statistics, it is imperative that our teachers combat this dilemma. 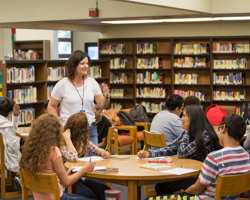 These battles are being fought and won by teachers like Ms. Julia Peacock, one of our English teachers at Perris High School. 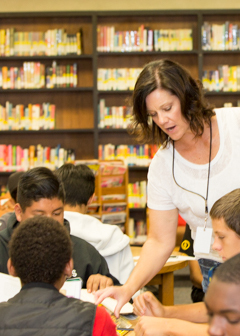 As a technology coach, I have had the good fortune of working with Ms. Peacock and hearing of the small victories taking place in her English and Reading Intervention classes. After helping her set up an online reading assessment that the students take on their Chromebooks, she relayed to me that most of her students read at least three years below grade level. “They didn’t understand vocabulary, and they couldn’t analyze literature. No matter how I tried to teach them, they gave me back blank stares,” lamented Peacock. For the first three days, her students would analyze three different strategies by writing three sentences for each strategy. “Fridays, when there was only one strategy left, I gave them the last strategy then an element of fiction to blog about (setting, plot, characterization, etc.) in Haiku,” (the learning management system we use at PUHSD). Ms. Peacock talks about one student’s experience that stuck out the most. “Kathie” had a hard time getting to school first period, so her first semester report card was riddled with Fs. Her first assessment result was a lexile of only 840 Which is an approximate 6th grade reading level -- 3 grade levels below 9th grade. However, after just a couple of months of diligent reading at home and completing reading logs in class, her second assessment showed an improvement to a Lexile of 1020 -- a 7.5 grade reading level. “Certainly, that could have been a fluke,” states Peacock. “Sometimes the second test is a big drop or gain from the first one, which is why I always give at least one more assessment so the numbers can even themselves out over the course of three test sessions.” Yet the results were undeniable. Kathie’s end of the year assessment showed an amazing improvement: 1145 Lexile -- a 10th grade reading level! Literacy matters. It has to.